This one's been coming for a while, hasn't it? 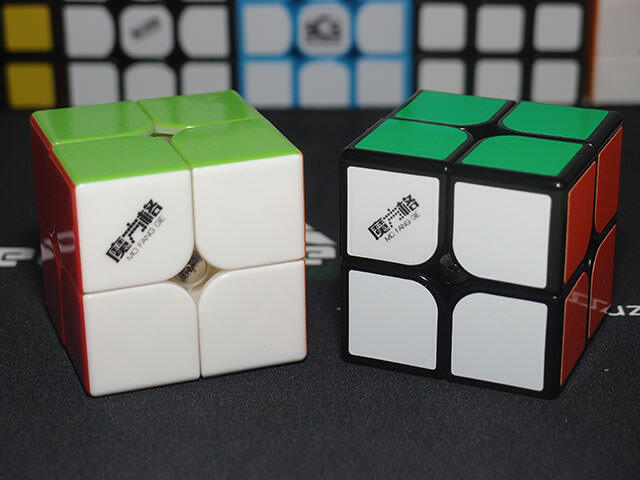 The Cong's Design Meichen was a pretty anticipated skewb teased months ago. We hadn't heard much about it since, until it was dropped on us a few weeks back. Let's see if it lives up to the hype, shall we? Skewbs are clicky puzzles. Almost all modern skewbs use ball bearings that snap into place, and certainly the two strongest contenders, the MoYu and the QiYi. There has always been a flaw with clicky puzzles, though: the click that you get is the click you'll always have, with no opportunity for customization. Cong's Design is a MoYu subbrand started by a cube designer, Mr. Fucong Fei, who also had a role in designing the original MoYu Skewb as well as the MoYu Pyraminx. 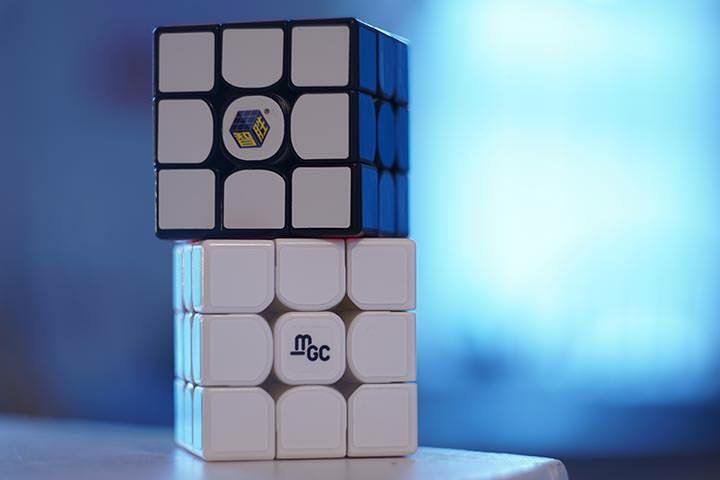 Taking the experience gleaned from those projects, Mr. Fei has released a new skewb aimed at the same market space the MoYu and the QiYi already occupy. 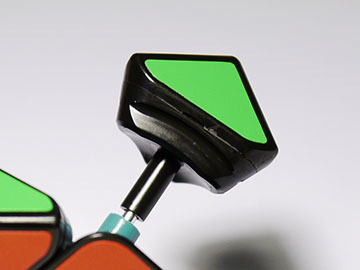 The whole idea of this Skewb is that not only does it perform as a flagship skewb should, it actually has an adjustable click. This was teased all those months back and has been what a lot of the hype has been centered around. 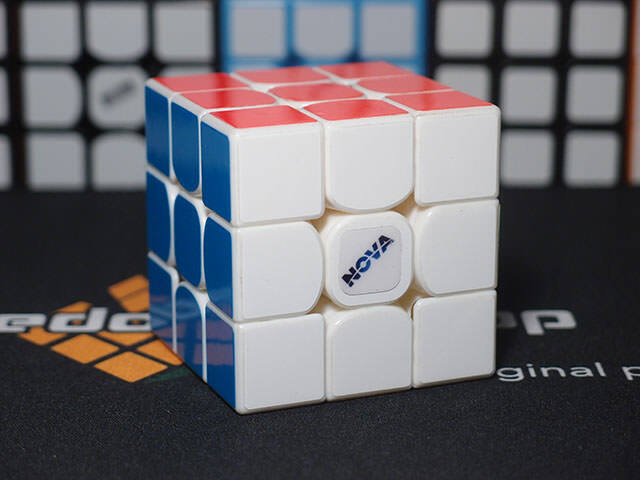 Also, it's available in stickerless, a first for a skewb. The Meichen looks quite distinctive from other cubes on the market - its Florian holes are huge. Older skewbs practically didn't have Florian holes, and the MoYu and QiYi skewbs had tiny little Florian holes the size of a grain of a pea. This skewb's Florian holes are so big you could jam a finger in them. As a result, the pieces look more rounded as well, and the entire skewb looks bubblier than others. It's built extremely solidly, and weighs a hefty 114 grams. It's also a bit larger than usual, measuring in at 57mm rather than the 56mm that has become standard nowadays. The sticker shades are standard MoYu shades, with fluorescent colors besides the light blue and standard red. It's for the first time available in the Moyu bright stickerless shades, which will appeal to a lot of the stickerless crowd. Oh, I had a lot of fun with this one. While I own other skewbs, this is the first skewb I've taken seriously, partially because I wanted to review it. I went into it not knowing anything about what kind of a setup I want. Because of that, after learning some skewb fingertricks, I spent literally hours playing around with the setup before settling on a setup I enjoyed. My setup is about three quarter turns looser than stock tensions (yes, I kept count), fully tightened clickiness screws (more on that later), and weight 3 on the pieces. It gave me a nice, controllable speed as well as a good amount of clickiness. This skewb seems to be designed as a bit more of a medium speed, controllable skewb than the fast and clicky feel of the QiYi or the slow and muted click of the old MoYu. Turning is extremely smooth in between clicks and has a bit of a swishy texture to it, and the slower speed makes it a very stable puzzle. The flexiness is quite different. The cube is very springy and loves to deform, and once deformed it tends to stay that way. What about the click? That's one of the most important aspects of this puzzle specifically, right? As I said before, the strength of the click is adjustable, ranging all the way from very soft to a medium amount, more than the MoYu but less than the QiYi. There's even the option of removing the click entirely. It seems that no matter what level the click is set at, it's not quite snappy the same way the QiYi is, but its adjustability range covers a good amount nevertheless. It's a good, universal feel. 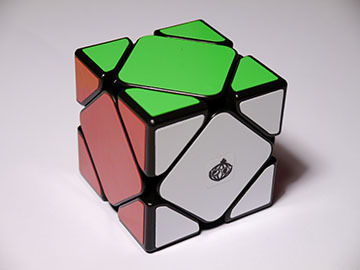 I think beginners would probably find the QiYi to fit their expectations of a skewb better, but the MeiChen wouldn't be hard to get used to and could be beneficial to more advanced solvers. Forward cutting extends up to about when the middle of a center piece crosses a line, which is about on par and actually a bit behind the QiYi skewb, which manages a bit over half. Reverse cutting, however, is where this cube really shines. Because of its large Florian holes, it manages more than twice the QiYi's reverse cutting, which measures in at about 5 degrees according to my measurements. However, whether amazing corner cutting is important or not in a skewb is debatable. It's a nice thing to have for sure, but most turning styles I've watched as well as my own don't use nearly as much of it as it has. I'm going to go ahead and skip anti-pop and anti-whatever failure might occur, since both due to the mechanism designs and the way the puzzle turns, skewbs are generally very reliable puzzles. I don't think you'll encounter any failures unless you're an extremely rough turner. 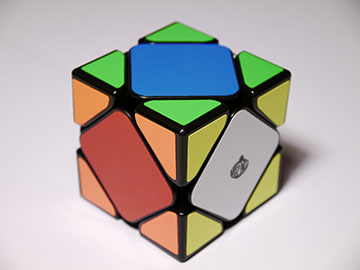 Skewb designs don't vary too much, and the Meichen is no exception. The mechanism of this puzzle is practically identical to the mechanisms of many other skewbs, and only the geometry is shaped slightly differently. The fixed centers don't have ball bearings, as usual. I have to wonder what would happen if they did. Could the puzzle become even clickier? The edge piece, or center piece if you'd like. You get the same wide, flat torpedo stacked on top of a wide, flat bar. It's in nearly every skewb. For some reason the torpedo is screwed on with screws, rather than being one piece as something like the QiYi is molded. Maybe it's to reduce manufacturing costs? Ahh, here it starts to get more interesting. You see the screw on the bottom of the corner base? It doesn't secure the corner base. 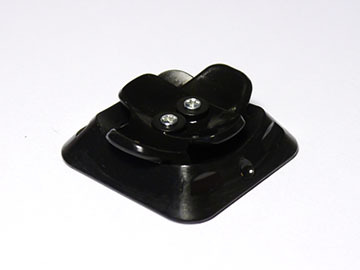 Rather, it controls a spring loaded button slotted into the middle of the corner base. The actual process of adjusting the clickiness is very simple. Tighten the screw to make it more clicky, loosen it to make it less clicky. The mechanism by which it accomplishes this is a bit more complex and rather ingenious. I'm going to take a knife to the corner and pry off a piece, since it is very difficult to open manually. 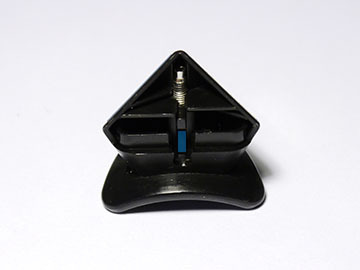 Highlighted in blue is a ramp that can slide up and down, which is attached to the button on the bottom of the corner feet. Depending on how far up it is, it changes the compression of the spring pushing against the ball bearing, which changes the click. 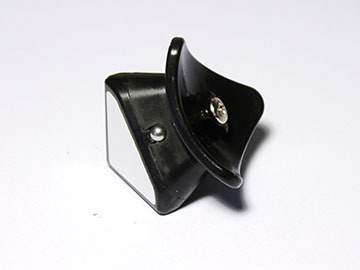 This is also the place to note: if you want to remove the clickiness altogether, remove the screw and the button from each corner, then remove all of the ball bearings and springs. You'll be left with a perfectly smooth skewb. Objectively, there's nearly nothing this skewb doesn't do well. It's a bit disappointing that the MeiChen was outmatched by the QiYi Skewb in forward cutting. However, in all other aspects, the MeiChen does nothing wrong and many things very right - it rocked the reverse cutting aspect and offers customization options no other cube has. Unfortunately, I don't have many criteria to grade this cube off of. Skewb is just not that kind of puzzle. I don't particularly love this cube but I don't mind it either, and would gladly main it in a competition. It's a bit too flexy but still a tad slow, and the click is too muted compared to the QiYi. However, I do like its controllability and silky smooth feel, and it is now the skewb I'd pick up and do solves on randomly over the QiYi (even though I still main the QiYi). In the end this skewb can easily be recognized as a top choice for speedsolvers, easily competitive with the MoYu and the QiYi. It offers the ability to customize its click as well, a feature none of the other ones have. I don't see this skewb completely dominating the market or obsoleting the MoYu and the QiYi, but it will likely make its splash and thrive in its own space. It's definitely a skewb worth checking out. 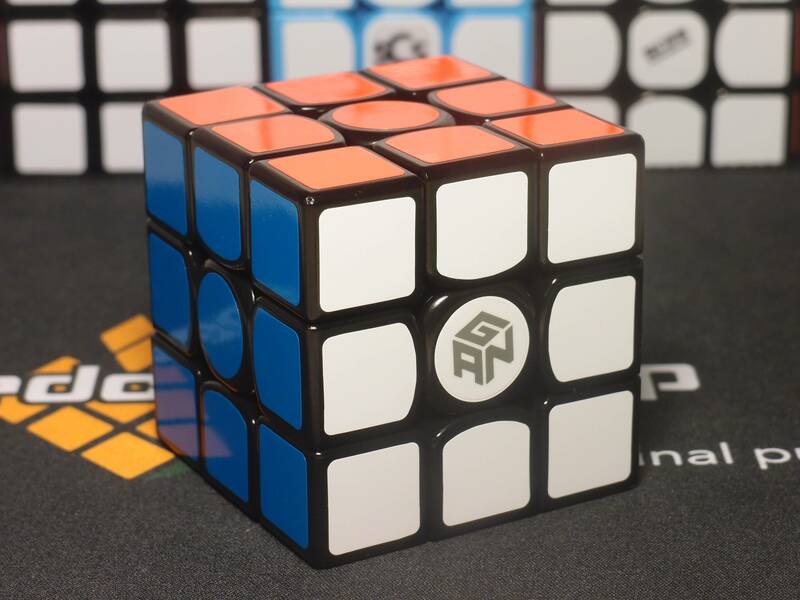 We'll just have to see how the MoYu Magnetic skewb is, as well as the new budget QiYi. Stay tuned for those reviews! 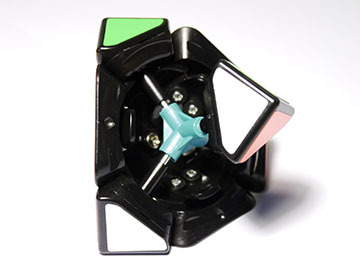 While the QiYi Skewb’s click is pretty easy to adjust, I don’t think QiYi has ever said anything about it being officially adjustable, so I can’t recognize it as such. I’ll have to look into it a bit more, but I remember something about the QiYi skewb not being available in stickerless for a while after the release of the stickered versions, as well as the fact that GuoQuan declared the MeiChen would be the first stickerless skewb. Of course, if I’m wrong I’ll update the review. Thanks for bringing these to my attention.